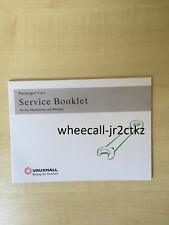 VAUXHALL SERVICE BOOK. THIS BOOK WILL COVER ALL MODELS DIESEL OR PETROL. GENUINE VAUXHALL ASTRA 'H'. GENUINE WALLET. OWNERS MANUAL. AUDIO MANUAL CD30 CD30 MP3. Covers: Petrol and diesel 3 door, 5 door, Estate and twin top, Manual and Automatic. QUICK GUIDE. TWIN TOP QUICK GUIDE. 1.4, 1.6, 1.8, 2.0 VXR, 1.7 CDTI & 1.9 CDTI. VAUXHALL ASTRA H. COVERS 3 / 5 DOOR HATCH, TWINTOP & ESTATE. OWNERS MANUAL & WALLET SET. RARE FACTORY ORIGINALS. VAUXHALL ASTRA MK5 1.4 16v 04-09 WHEEL NUT BREAKING. 2008 VAUXHALL ASTRA MK5 1.4 16v OWNERS MANUAL IN GOOD CONDITION. 5 speed manual, 3door hatchback in black m ost parts available. You may also be interested in. 5 booklets which are shown in the photos I no longer have mine hence selling. 2008 VAUXHALL ASTRA 1.4i 16V SXi 5DR MK5 HATCHBACK. 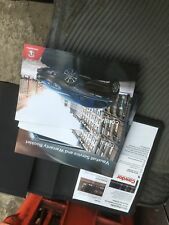 OWNERS MANUAL HANDBOOK WITH COVER. 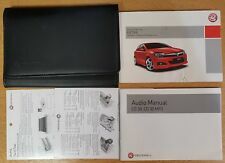 Owners Handbook and audio manual to suit Vauxhall Astra 04 - 2009. Great Condition and also includes black leather wallet. 1.4, 1.6, 1.8, 2.0 TURBO, 2.0 VXR, 1.3 CDTI, 1.7 CDTI & 1.9 CDTI. 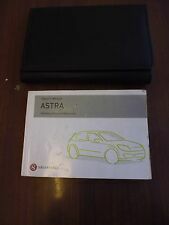 VAUXHALL ASTRA H OWNER MANUAL & WALLET SET. COVERS 3/5 DOOR HATCH & ESTATE. This Edition Handbook January 2008. To Fit Model Years: 2004 - 2012. Manual / Automatic. 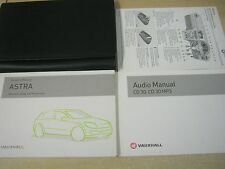 Genuine Vauxhall CDC 40 Opera Audio Manual. This is the instruction book for the factory standard CDC40 Opera Audio system, found in many Vauxhall models from the late 2003 onwards. Consequently, they should be treated as a guide only. GENUINE VAUXHALL ASTRA 'H'. ORIGINAL VAUXHALL FAUX LEATHER WALLET. OWNERS MANUAL. AUDIO MANUAL CD30, CD30 MP3. QUICK GUIDE. NOW FOR THE BORING BIT. GENUINE VAUXHALL ASTRA 'H'. GENUINE WALLET. OWNERS MANUAL. PRINTED 2010. QUICK GUIDE. GENUINE VAUXHALL ASTRA 'H'. HIS HAS ALL THE INFORMATION ON HOW TO OPERATE YOUR VAUXHALL ASTRA SAFELY AND PROPERLY. ORIGINAL VAUXHALL FAUX LEATHER WALLET. QUICK GUIDE - ASTRA &TWINTOP. OWNERS MANUAL. GENUINE VAUXHALL ASTRA 'H'. GENUINE WALLET. OWNERS MANUAL. AUDIO MANUAL CD30 CD30 MP3. Covers: Petrol and diesel 3 door, 5 door, Estate and twin top, Manual and Automatic. QUICK GUIDE. GENUINE VAUXHALL ASTRA 'H'. GENUINE WALLET. OWNERS MANUAL. AUDIO CD30, CD30 MP3 MANUAL. QUICK GUIDE. GENUINE VAUXHALL ASTRA 'H'. GENUINE WALLET. OWNERS MANUAL. AUDIO CD30, CD30 MP3 MANUAL. QUICK GUIDE. PRINTED 20 04. GENUINE VAUXHALL ASTRA 'H'. GENUINE WALLET. OWNERS MANUAL. AUDIO CD30, CD30 MP3 MANUAL. PRINTED 20 09. GENUINE VAUXHALL ASTRA 'H'. GENUINE WALLET. OWNERS MANUAL. Covers: Petrol and diesel 3 door, 5 door, Estate and twin top, Manual and Automatic. QUICK GUIDE. TWIN TOP QUICK GUIDE. GENUINE VAUXHALL ASTRA 'H'. GENUINE WALLET. OWNERS MANUAL. AUDIO CD30, CD30 MP3 MANUAL. QUICK REFERENCE GUIDE. PRINTED 20 09. VAUXHALL ASTRA 'H'. HIS HAS ALL THE INFORMATION ON HOW TO OPERATE YOUR VAUXHALL ASTRA SAFELY AND PROPERLY. ORIGINAL VAUXHALL FAUX LEATHER WALLET. OWNERS MANUAL. AUDIO MANUAL CD30, CD30 MP3. QUICK GUIDE. GENUINE VAUXHALL ASTRA 'H'. HIS HAS ALL THE INFORMATION ON HOW TO OPERATE YOUR VAUXHALL ASTRA SAFELY AND PROPERLY. ORIGINAL VAUXHALL FAUX LEATHER WALLET. OWNERS MANUAL.